You get to define what prosperity means for you and to seek out that which fills your heart with light. Often, a culture can define prosperity relatively narrowly, and while cultural pressures can be great, we do possess agency. Agency is the ability of a person to think, make choices, and act as an individual. Our lives are a balance between structure (cultural learning and enforcement) and agency. Some social pressures feel so great, but when we finally gather the courage to challenge them in our lives, we find that the world continues to spin, and that rather than feeling greater pressure for stepping outside the box, we can actually feel more free. We find other people who define their goals and values in the same way, and we discover that the dominant culture is not the only culture available to us. In what ways is this in line with and/or at odds with dominant cultural ideas about prosperity? What kinds of actions or choices can you make to create prosperity (as you define it) in your life? 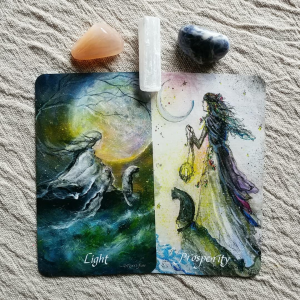 Where can you find others who feel the same way you do, who will offer support and light?